Francis was lucky enough to get guest list tickets for the stage show of The Mighty Boosh recently. 'The what?' said all my friends. First impressions: we had clearly stumbled into a new religion. The audience went wild for it. It was like Monty Python meets Rocky Horror. Delirious surreal nonsense. Gorilla suits, 'manginas' and quiche. We'll have to check out the TV series. Ah you lucky thing! 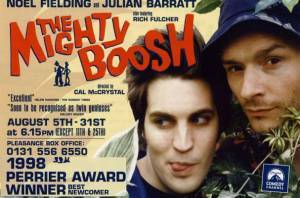 I love the boosh. I do know both people who have never heard of it and others who just don't like it. Madness! I am fascinated by this show - I like it because it just seems like friends messing around in some private spaced out universe. Wish I'd gone, now!